Good news pro wrestling fans. You don’t want Snooki and Snooki doesn’t want you. After her performance at WrestleMania 27, Snooki told TMZ that her wrestling career is over. So much for that Snooki vs. Awesome Kong match. The Snooki backlash in the pro wrestling world was something else. For one, the ratings for her segments were terrible on WWE RAW. Two, the Jersey Shore was booed at every WWE event she attended. There was definitely no love lost between the Snookster and her non-adoring pro wrestling public. With all of that said she certainly didn’t embarrass herself at WrestleMania 27. Snooki is a former gymnast and utilized those skills to her advantage. Snooki only did two gymnastic moves but that was enough to win the match and actually garner some cheers from the hostile WrestleMania audience. Quite honestly it was arguably better than anything seen in the main-event which says a whole heck of a lot. I just hope that the low pro wrestling ratings and wrestling backlash will put an end to this trend of seeing Jersey Shore kids in pro wrestling. TNA Wrestling was the first by using J Woww in a wrestling angle with two of their performers. Next they signed Angelina who isn’t even on the show anymore and booked her to wrestle a couple of matches. All of the Jersey Shore segments on TNA Impact bombed in the ratings as well as among the wrestling critics and fans. I get the idea of mixing celebrities and pro wrestling but there are just some celebrities that aren’t going to work in pro wrestling. I believe that people watch Jersey Shore for the show and not any particular star. Those viewers aren’t that vested in Snooki to pay $55-65 to see her wrestle on WrestleMania 27. 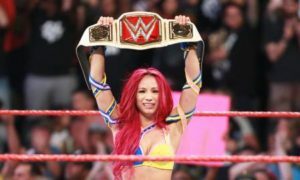 The irony here is that there are reports that indicate that the WWE would welcome her on board as a full time WWE Diva if she was interested. I am sure that thrills the WWE roster, especially Trish Stratus and Lay Cool who waited three hours for her to show up to a video shoot. Some reports also indicated that Snooki was interested in becoming a full time WWE Diva at some point, but thankfully that won’t be anytime soon. Pro wrestling fans have no interest at all in Jersey Shore. There is no crossover appeal whatsoever between audiences. My hunch is that most of the Jersey Shore audience is teenage girls and another guess of mine is that there isn’t a huge teenage girl audience watching pro wrestling. There are plenty of professional sports athletes who love pro wrestling, could get the same media attention, and be welcomed by the WWE audience. See you in the WWE Hall of Fame Snooki.